In one of Barnard College’s favorite traditions, this year’s Convocation ceremony took place on September 12, 2017, in the majestic and historic Riverside Church. Hundreds of students, trustees, faculty, staff, distinguished guests, and alumnae going back to the Class of 1938 participated in this college-wide celebration. Nearly 70 alumnae class officers marched in the ceremonial procession dressed in academic regalia and carrying class flags, cheered on by new and returning students. This year, Convocation marked not only the beginning of a new academic year. It also ushered in a new era for the College under the leadership of Sian Beilock, the College’s eighth president. President Beilock was most recently executive vice provost of the University of Chicago. A cognitive psychologist, she is an expert on how children and adults learn and perform at their best, especially under stress. Keynote speaker Carol Dweck ’67, the Lewis and Virginia Eaton Professor of Psychology at Stanford University and one of the world’s leading researchers in the field of motivation, discussed the process of becoming and how to develop one’s potential. She explained that intelligence is elastic and can be developed, and that as opposed to a mindset of fixed intelligence, a “growth mindset” enables people to seek more challenges, show more resilience, and achieve at a higher level when facing difficulty. 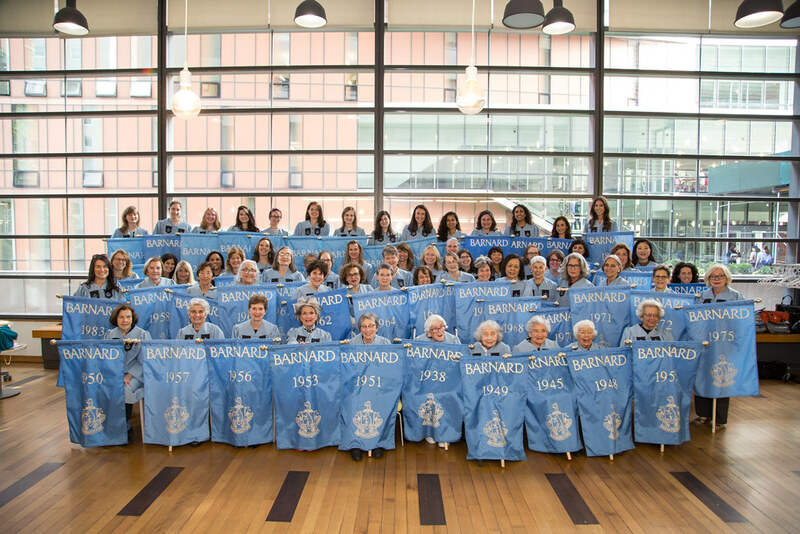 In 2014, when Barnard celebrated its 125th anniversary, the College began the tradition of inviting not only first-year students but the entire Barnard community to kick off the academic year. Among the participating alumnae was Ellen O'Brien Saunders, '63, who traveled to Barnard from Washington State to represent her class as Class Officer. "I love seeing my classmates and also the younger alumnae and the students. It's wonderful to see the vitality on campus." Students from first-years to seniors took part, wearing special t-shirts for the occasion. Class of 2021 student Ellie Harrison said, "I have sisters who have gone to Barnard and it's a tradition in our family that you go to Barnard and you come out totally ready to go, a fired-up woman, and that's the image I associate with Barnard. Convocation is a really cool way to start the year and a really cool way to get everyone ready to go." Convocation was a moment of community, unity, and excitement over new beginnings. Watch comments from keynote speaker Carol Dweck '67, students, alumnae memories and the full Convocation ceremony.